According to our multi-review-based ranking system, the best electric kettle 2019 should be the Vivreal Borosilicate Glass, and the second best electric kettle 2019 is the Breville BTM800XL One-Touch Tea Maker. 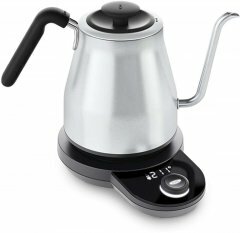 Here is the full top 10 list, then sub-categories and a complete list of electric kettle brands and models. 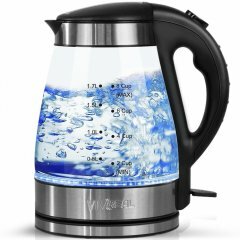 Based on this electric kettle's aggregated ranking of 92%, we are confident that the Vivreal Borosilicate Glass is, as of now, Alphachooser's best electric kettle 2019. Furthermore, we think that our 368 reviews sampled from our sources give us a high confidence level (more on confidence levels) that justifies making it a "no-brainer best choice." Based on star rating of 4.5 averaged over 1534 reviews, here is second best electric kettle. 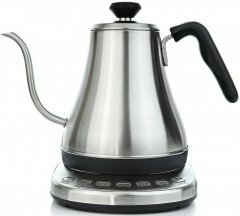 * This list, by the way, is based on an in-depth computation of hundreds of electric kettle reviews from across the web. 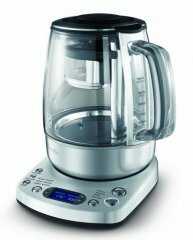 The Hamilton Beach 41020 is the newest electric kettle by Hamilton Beach. All Hamilton Beach electric kettles. The Gourmia GPK720 is the newest Gourmia model. The Aicok KE4012 is the latest Aicok model. The Breville BKE700BSS Soft Top Pure is the latest electric kettle by Breville. The Chefman RJ11-GN is the newest model by Chefman. The Ovente KD640B is the newest model by Ovente. The Oster BVSTKT308-033 is the latest electric kettle by Oster. 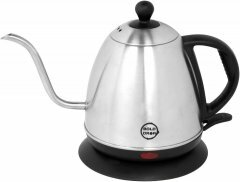 The Bella Ceramic 14537 is the newest electric kettle by Bella. 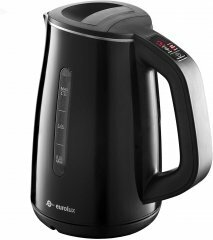 The Cusimax CMCK-100E is the newest electric kettle by Cusimax. The Cuisinart CPK-17 PerfecTemp Cordless is the newest Cuisinart model. The Aroma AWK-1400SB is the newest model by Aroma. The Bonavita BV382517V is the newest Bonavita one. The Capresso H2O Steel PLUS is the latest model by Capresso. The Kitchenaid KEK1322 is the latest electric kettle by KitchenAid. The Krups Savoy BW3140 is the latest KRUPS one. The Magic Mill MEK-3900 is the newest model by Magic Mill. All Magic Mill electric kettles. The Proctor Silex 40940 is the latest Proctor Silex electric kettle. All Proctor Silex electric kettles. The VAVA VA-EE011 is the newest model by VAVA. The T-fal KI160US is the newest electric kettle by T-fal. The Epica Double-Wall Stainless Steel is the newest Epica one. The Brentwood KT-1960BK is the latest electric kettle by Brentwood. The Brewberry Premium Elite is the newest Brewberry model. The Kalorik Glass Teapot is the latest Kalorik model. The Rosewill RHKT-17002 is the latest Rosewill electric kettle. The Adagio Teas VarieTEA is the latest model by Adagio Teas. 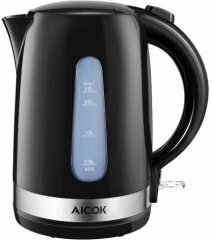 All Adagio Teas electric kettles. The Chefs Choice 673 is the newest model by Chefs Choice. All Chefs Choice electric kettles. The Melitta 1.7-Liter is the newest model by Melitta. The Maxware F002-1.5L is the newest Maxware model. The Nesco GWK-02 is the latest Nesco electric kettle. The Sunbeam BVSBKT3234R-033 is the newest Sunbeam model. The Eurolux Cool Touch 2016 is the newest Eurolux one. The OXO Adjustable Temperature is the newest electric kettle by OXO. The Molla Contento is the newest model by Molla. The Secura SWK-1711TDB is the latest model by Secura. The Midea MEK17GT-E8 is the latest electric kettle by Midea. The Russell Hobbs KE5550BKR is the newest model by Russell Hobbs. 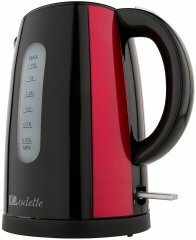 All Russell Hobbs electric kettles. The Willow and Everett Gooseneck Temperature Control is the latest model by Willow and Everett. All Willow and Everett electric kettles. The Stariver Gooseneck is the newest model by Stariver. Entry-level 1.6-liter 1500-watt stainless-steel electric kettle without bells and whistles but with two years of warranty. 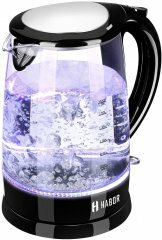 Average 1.7-liter glass electric kettle with a Schott-glass decanter and typical kettle features for its price range. A 4-liter kettle (larger than most) with an energy-efficient vacuum insulation mode designed to reduce energy use. 1.7-liter electric kettle with a Strix thermostat and the Good Housekeeping mark and UL marks of approval. Budget-friendly 1.2-liter 1000-watt electric kettle with a stainless-steel finish and two other size options (1.7 and 2 liters). 1.7-liter 1500-watt stainless-steel electric kettle with dual water gauges and an LED-illuminated interior (when in use). 1.2-liter stainless-steel kettle with NRTL-approved safety features and a patented Strix temperature controller. 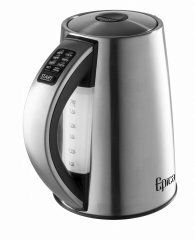 1.7-liter 1500-watt stainless-steel electric kettle with standard safety shutdown mechanisms and a UK-made concealed heating element. Vintage-looking 1.7-liter electric kettle with a three-level auto shut-off feature and a removable anti-scale filter.